Sorry for the lack of post the last two weeks. I was traveling for work last week and my evening have been busy with family stuff every night this week. So this is the first chance I've had to sit down and right up a blog post. Over the last two weeks I've had the chance to do a handful of games to try to test out some of the afore mentioned armies that I was looking to tweak into 6th edition. Here is a quick summary of how things went. 2k Tau vs 2k Bugs- This game was a killpoint game which really helped me I think. Basically I just shot little bugs for a few turns and eventually the big bugs made combat and wiped the squad they charged. Then I just shot the big bugs dead. Not everything worked the way I hoped but the farseer came up clutch on shutting down iron arm right when I needed him to do so. 2k Tau vs 2k Harliestar- This was a practice for Feast of blades and had essentially 4 objecitves. I poured a ton of fire into the Harlies that did pretty much nothing, but in return he failed two charges. Finally I whittled down that unit before they made combat, but could never get rid of them by the end of the game. A lot of shots might have been better directed to his scoring units. The Kroot infiltrated on an objective and managed to hold it all game. Stealth suits also infiltrated but damn fire dragon exarch has krack shot and downed enough for a LD that they failed and never recovered. In the end the game was a draw. 2k BA vs 2k Harliestar- Another Feast of Blades practice with 6 objectives but you could not take the 'close' ones. This game looked ugly early but the turned in a big way for me by turn 3 when the harlie/vect unit went down hard. I had a few 'solo' guys running around holding up his last troop choice and in the end was able to claim two objective while tying up his last troop on another for a win! 2k Orks vs 2k Harliestar- Another Feast of Blades mission that was a fancy kill point game. My first time out with the Mad Doc and it wasn't as bad as I thought with the 'must charge nearest unit' rule. Maybe in a objective based game I would have preferred him to sit around. Essentially that unit just devoured his backfield, and while the harliestar was eating my backfield it was essentially 8 to 3 in my favor when we called it in 5 realizing he would never be able to claim but one or two more units in any remaining turns. So there you have it. I'm not sure that is quite enough of a sample to have any giant take away on any of the list but it was fun to get these armies into the rotation and see how they fared. Beyond that obviously there has been a lot of Chaos stuff popping all over the internet. 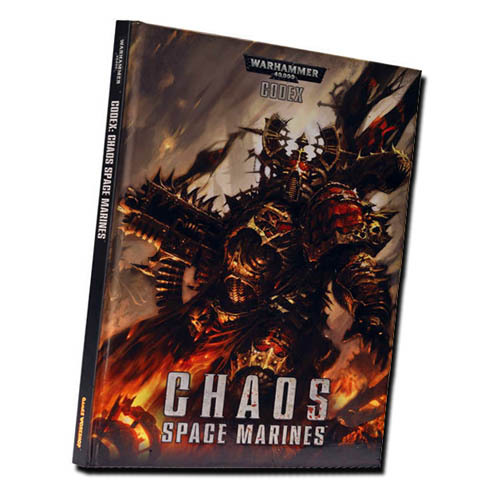 A lot of things look really cool if you were just going to start yourself up a new Chaos army. I think making a Iron Hands army where you flood the field with AV 12 could be really cool! But in the end I think that horde CSM is going to be a real winner. A few cutltists blobs backed by advancing CSMs with Havocs with flakk missiles in the back field is going to be deadly! A Typhus army with lots of cheap FNP/Fearless zombies seems ridiculously hard to shift! But for a lot of old school CSM owners there is a bit of angst over what to do. Many of us were mono god oriented and are looking to continue in that theme. I think the new rules certainly allow for it (just have to take a HQ marked as such for cult units to be scoring) but I still think it might fail to be as competitive as the above mentioned lists. Zerkers now desperately need the charge. Noise Marines can ignore cover with the sonic blasters but lose the ability to move and shoot. 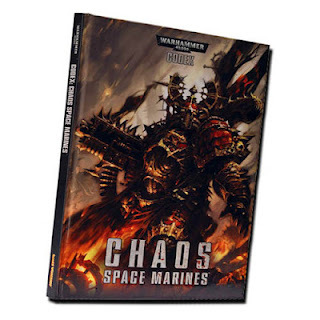 Pms seem pretty much untouched, and with the above mentioned Typhus/Zombie horde is probably going to still be the winning 'faction' of Chaos. Then there is my lovely 1ksons. On the plus side they seem to be cheaper if we don't have to pay for powers and we also seem to have lost 'the sorcerer commands rule.' It is looking like you have to buy the Soulblaze upgrade, which if it were free would be neat but I don't know that it is worth the points. Overall these are all nice perks, and with the overall changes to 6th edition I would say they are better than they were in 5th. It doesn't seem that we get the relentless rule as rumored with the sorcerer which would have been nice for the sake of overwatch. What I'm not sure about are these powers. The primary power is a blast that seems like it might be nice for anti horde which has been something I've struggled with in the past. The Boon table is neat but I'm not sure I'm willing to try to spam it and pay for the 'start the game' power to try to get a DP (which isn't as great as I would have hoped anyway). Bolt is nice as always but then the sons aren't shooting at units which they need to be doing. And the template of death is also nice though might be situational. So the primary power is likely going to be the default for the aspiring sorcers. I'm definitely going to give Ahriman a try now. The Infiltrate warlord power opens up so intersting options with infantry options (1ksons, oblits/maulers, termies). The three witchfire powers a turn I'm less excited about. I'm assuming he still can't do three of the same so... you're going to need to do three differnt witchfire powers? Well that's going to be tricky/situational at best. Maybe I'm missing something that makes this better than I'm thinking. Either way while not having Divination blows I'm thinking Biomancy and Ahriman could be pretty crazy. Beyond that I kinda need to see how the rest of the book shakes out to figure out what to do. Obviously I'd like to make an army that is competitive but this was always about being my 'pretty army' and I'm not looking to do a lot of dumping of units. So right now the lesser daemons and the DP are out, and Ahriman, and Aegis, and cultists are probably all going to be in the new list. The question is how do those points shake out now? Do I just drop the old Dread (now Hellbrute)? The termies look to have a lot of new configs so how does that shake out now? Do I need rhinos? Since my 'oblits' are the sorcerer lords do I try those out as Maulers? Another week and we'll have a pretty good idea of where to start!